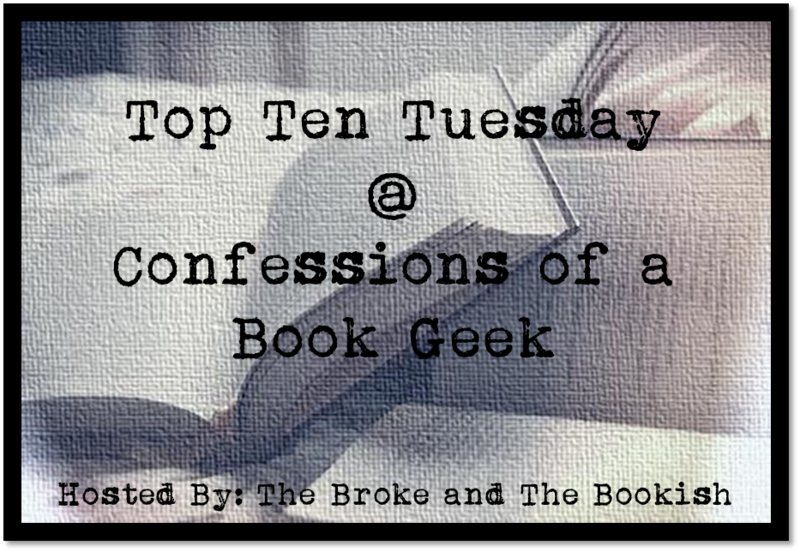 There are quite a few books I could include in this list, but many of them have already made appearances in other Top Ten Tuesday posts of mine (*cough* The Girl With The Dragon Tattoo *cough*), so I’m going to try and include as many new-to-my-TTT picks as I can… Most of these haven’t been read, because let’s be serious for a minute, the Hype Monster is terrifying. 1. The Book Thief by Markus Zusak – OK, we’re off to a bad start, because I have written about this one before, but that was before I started reading it. I wasn’t gripped by it at the time and put it down… Everyone seems to talk about this book, and love this book, and it’s narrated by death, and yadda yadda. I just haven’t felt the urge to pick it up again since, but I will, someday. 2. Pride and Prejudice by Jane Austen – I’ve always struggled with the classics (I feel like I say that a lot), but I’ve made some progress in the past year (yay for To Kill A Mockingbird!). Unfortunately, this is one I haven’t made any progress with yet. I did watch the BBC adaptation, and I really enjoyed it, and I tried to read this again after watching it, and it really was a much more enjoyable experience… but I’ve yet to finish it. I will though. 3. Station Eleven by Emily St. John Mandel – This book went through a phase where it was just everywhere, so much so, that I actually bought it. So that’s a start. But then, I started seeing really mediocre reviews once the hype died down a little, and it’s made me scared. 4. Daughter of Smoke and Bone by Laini Taylor – I know. Shame on me. One of the most hyped series on the inter-webby-waves and I haven’t even attempted to get my hands on it yet. This is another one I feel will definitely happen some day. Praise gets heaped on this series all the time! 7. The 5th Wave by Rick Yancey – Another one I own but haven’t read yet. When I realised it was (yet another) series, I lost enthusiasm to be honest. I’m doing good at buying hyped books (and for cheap, I got this as a brand new hardback for less than £1! ), I’m just not so good at reading them. 8. The Night Circus by Erin Morgenstern – I don’t even have a clue what this one is about, but the cover looks interesting, Brandie liked it, and it seems to pop up all over the place. 9. Cinder by Marissa Meyer – This is a tough one. Sci-Fi usually doesn’t rock my boat (edit: The Hitchhiker’s Guide To The Galaxy didn’t rock my boat), but I’ve heard SO MANY good things about this series. I own Scarlett, because I picked it up new for less than £2, but unfortunately Cinder wasn’t on offer. And we all know I rarely do full price books! (Unless you’re Colleen Hoover, then I do full price books). 10. The Maze Runner by James Dashner – I picked up the full series on The Book People for a great price, but then I started hearing bad things about the books once the movies were released. No doubt I’ll get to these at some stage, but for now they lounge quite happily in my dining room. Have you read any of the books on my list? Do you think I’m CRAZY to not have read any of them yet? Let me know in the comments, and link me up to your posts! I haven’t read any of those, either! But I’m curious about the Night Circus, the Book Thief and Cinder after reading so many positive reviews about them. I have a lot of these on my TBR as well. Great list! I couldn’t really get into Shatter Me, but I know a few people who loved it. I would love to read Station Eleven sometime this year. I have to admit that I have a couple of these on my shelves and still haven’t read them. A few of these also made my list – although I should add The Maze Runner, as well! I’ve only read Pride & Prejudice (required school reading). You’re not crazy for not having read these books. Some – I think pretty much all for that matter – of these books I have not read either. But I do plan on reading them! One last disclaimer: don’t let the sci-fi tag scare you off. It’s NOTHING like Hitchhiker’s. Trust me. There are so many series that are simply daunting to start. But of the standalones, I’ve been quite interested in Station Eleven for a while but just haven’t found a cheap enough copy for me to get. Plus, with my intent of reading more CanLit (even though I’ve heard that it’s described as CanLit dressed as American-Lit) it should be a solid choice for me. Thats’ funny you have Rainbow Rowell books on your list. That is on my list too, I haven’t read any of them, though I do have a hard back copy of Landline here waiting to be read. I’m actually surprised by some of these that you’ve not read, not that I can judge, the number of books that are hyped and I’ve managed to miss is shocking. I can say I’ve not read The Book Thief either, though. I remember all the hype, and everyone says such good things, but I just could not get into the book. I even saw the film, and it was a good film, but even that didn’t motivate me. But you haven’t read Cinder, P&P, Eleanor And Park (that one didn’t live up to the hype for me) DOSAB or The Night Circus? Pride and Prejudice is a classic for a reason, at the same time though the BBC adaptation is basically as good as the book it covers all the major things in the book, but definitely give it another try. Cinder is amazing, I absolutely loved it, it’s such a good retelling, one of my favs as is DOSAB, that is a classic, but I can sort of understand people avoiding the hype. As for The Night Circus, I read it before I blogged so missed any hype but I absolutely adored it, it’s so magical. Lol I know, I’m a terrible book blogger. Shatter Me is amazing! They get better and better as you keep on reading, and Ignite Me is just – wow. It fits in the dystopia category but, to be honest it IS a romance, yes there’s a dystopian setting but with most books in that genre the romance doesn’t take centre stage where as this does, but I love it so much. Warner is life.